Why does a baby wait until about four months to finally kick its legs? Have you ever seen this? The first four months they are a snooze fest. They’re so boring. They don’t even make eye contact. Then, we freak out at three months when they hold their heads up. Later, at four or five months, they finally zoom in and start to kick a leg. Why do they wait four months to do that? What are they doing in that four months other than pooping, eating and crying? They’re establishing intra-abdominal pressure and taking the pressure off the bursa. If this area is tight, can it then also be mobile? You can’t ask iliacus to both stabilize you proximally and be a prime mover and hip flexion and external rotation. What about our clients and patients who sit in a desk all day? What are they doing? If we keep the iliacus in a short, binding position from sitting—what happens when we stand up to ambulate? There’s a gigantic artery, a gigantic vein, a gigantic nerve, the nerve that innervates the iliacus called the femoral nerve. The femoral nerve is L2 to L4 in the lumbar spine. That area comes out from the back, where iliacus can steal its own innervation by compressing these segments. If iliacus is in a short position, what happens to the hip in a fully flexed position? 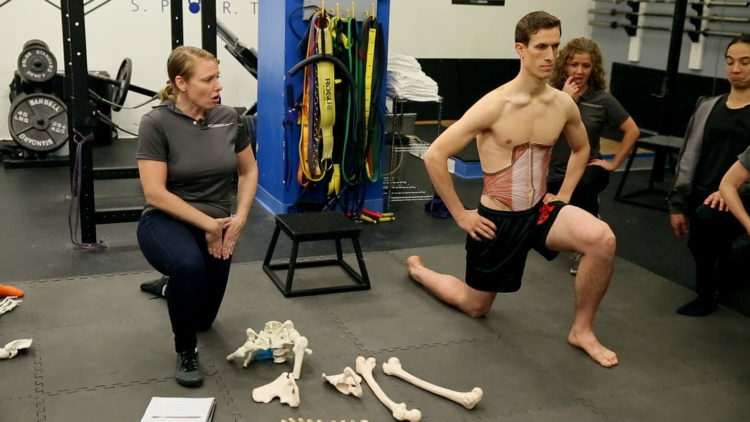 Is hip compression a good thing? Of course it is! Sure is during two phases of gait, the swing phase and suspension. When you do a lunge, is compression of your hip good? Of course, it is. But is it good on both legs? Not so much. To train a decompression of the hip or to get a stretch of iliacus, we put the knee down. This half-kneeling position is my work position. Anyone who sees me as a patient sees me work in this position all day. Why would I do that? If I sit on a chair, it’s going to compress the hell out of my hips all day. Although hip compression is good in certain phases, it’s not so great in others. You want to be able to make sure you can do both. You’ll see me switch all day long and make sure I maintain this position. For your clients and patients who have skipped this phase of development—which is the 11th-month position of the baby—can you see how that develops hip problems later? Did you start walking before 11 months? I did. That’s why I spend all day in this half-kneeling position. I started walking at nine months. Keep your kids down. Don’t let them get out of this position too early. They need to develop that hip decompression and compression relative to each femur. Get into half kneeling—the lunge position with the knee down—and take a deep breath. What happens? You fill up like balloon. If you’re filling up like a balloon, what’s happening to your left hip? It’s decompressing. Wouldn’t this be a wonderful way to work? Wouldn’t this be a wonderful thing to do to break the monotony of sitting at a desk? If you’re trying to maximize the iliacus ability and strength in a short position, you would train something like a lunge, where the front leg can compress the hip and the back leg can decompress, and then switch it. Have you seen someone with a chronically compressed hip? It’s always on its sockets. Some people call it a “short leg.” Or constant hip hike. The iliacus can be very problematic in this chronically short position, in addition to being crappy at true compression. If you’re pathologically compressed, you don’t compress well, and you also don’t decompress. What do you think is the result of a chronically compressed and shortened or a semi-shortened iliacus? And with all that compression, they don’t compress well, either. Just because they are in compression doesn’t mean they do it well. Over time, they’re wearing away the cartilage. They’re developing iliopsoas bursitis, which is a warning sign for hip compression. In the floor of the femoral triangle, we have the neurovascular bundle. This particular tightness can shut off blood supply to the hip itself. The tighter the iliacus, the more the compressing of the artery called the “medial femoral circumflex artery” that actually feeds the hip. Not only are you shutting down the motion of the hip, you’re shutting down its blood supply along with his brother pectineus. This is not good. Feel this for yourself. If you’re comfortable being on your knee, take a knee, and get your get your neck long, chin tucked, chest wide, ribs down. Then put your hand on your pocket, whichever pocket is the one with the knee down. I want you to feel the 30 degrees of hip extension you might be allowed. Use no back extension. The back does not move. Take a nice deep breath in. Make sure your back doesn’t move, and then let that hip come forward. Let that front hip’s iliacus compress in the x-axis. Let it decompress on the knee that’s down. Just feel that opening. How wonderful is that? It’s such a great feeling. How many of your clients need this? So many. Start asking them questions about when they started to walk. If they started to walk before 11 months, they are prone to have compression issues. They’re going to be at risk for needing a total hip replacement later in life if they don’t fix it earlier. Teach them how to build strength and capacity in intra-abdominal pressure, so they can take the pressure off iliacus. Use the lunge position to help your clients regain compression and decompression—and for some of them, gain it for the first time.